In 1997, Oberon’s self-titled mini album was one of the very first releases by Prophecy Productions. 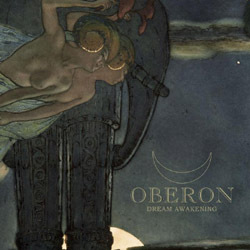 Now, after two full-length albums, “Mysteries” in 1998 and “Anthem” in 2001, as well as a single “Big Brother” in 2000, which were self-released by the artist, some musical explorations under the monicker of Future Whirl and a long-term creative hiatus, Oberon is back with his first album in 13 years. “Dream Awakening” is a journey through a diverse and imaginative musical landscape full of contrasts, emotions and mystical symbolism, blending new artrock with avantgarde pop and even elements of neofolk. More than a year in the making, the album is conceptually characterized by the image of the Phoenix and tells the story of the soul’s path towards awakening - of man’s struggle to gain self-knowledge. It will be released via Prophecy Productions in digipak edition on 12th of September 2014. This day also sees the release of enhanced reissues on the project’s entire back catalogue. The classic “Oberon” will be enhanced by the songs of the very rare “Through Time And Space“, and the actual debut album “Mysteries” will come as a double CD including the tracks of the “Big Brother” vinyl single, the experimental “Anthem” album plus three yet unreleased recordings. All 3 releases are available for pre-order on Prophecy’s web-shop. Tracklist and cover artwork of ”Dream Awakening” is revealed and you can also get a first taste of the upcoming album watching the short teaser below.